From time to time club members ask how to modify the name that appears when they send out group texts to other members within our club using our special GroupMe account. So, I’ve created this short video that demonstrates how to make such changes. Hopefully this will help everyone with the matter. This weekend was perfect weather for some fall flying. Luckily, we had a couple new visitors fly with us this weekend. Harold Belcher and Brian Sumpter paid our club a visit. Harold is from Big Stone Gap, VA. Harold, likes building the FliteTest planes and the Experimental Airlines planes. He brought out full sized and scaled down versions of the Experimental Airlines Peace Drone. Harold had even built his large Peace Drone plane with the foldable wing that makes it great for transporting. Good times were had among the group discussing and flying the foamboard constructed models. Brian is from Greenville TN and is really into FPV. There was lots of discussion on what it took to get into FPV. Brian set up his viewing monitor on a tripod and we got to watch as he used his FatShark goggles to pilot his quadcopter to some amazing heights and distances. Jack and I invited them to come back and fly with us and encouraged them to join our club. Watch in 1080P HD on YouTube.com Jeremy is flying the Bixler 2. Charles is behind him with his HawkSky. The HawkSky has a mobius camera mounted on it. Capturing good aerial video like this is a bit harder than you’d think. Check out Jeremy’s radical maneuver at 21 minutes. Hope you enjoy the video. 1. It’s scaled up 148% in size resulting in a 57″ wingspan that fits door-to-door in the back of his car/truck. 8. Most importantly, it flies and performs amazingly well with this basic configuration. Watch how well the plane does vertical climbs in the video.! Spoiler alert….I know this is a long video, but if nothing else, watch the “spot-on” landing at the end of the video! Watch in 1080P on YouTube. My badly beaten HawkSky and Jeremy’s fully trimmed out Bixler 2 Share Air Space. My HawkSky is still going strong despite being composed mainly of hot glue after being crashed so many many times. Jeremy has his Bixler 2 fine tuned and flying super smooth. What a great day to share some air space! Watch in 1080P HD on Youtube! Jeremy’s FliteTest Storch and my custom 57 inch Versa Wing Share Air Space. We’re both kinda new to RC building and flying…but we’re both fans of the FliteTest designs. Jerem’y FT Storch is built from the basic FT plans with a few minor modifications. My FT Versa Wing is built from FT plans that were scaled up to 148% resulting in an overall wingspan of 57″ (Almost too wide to fit the back of my car or truck). Both planes fly wonderfully! Wanna get in on the sport…contact us about visiting our club. 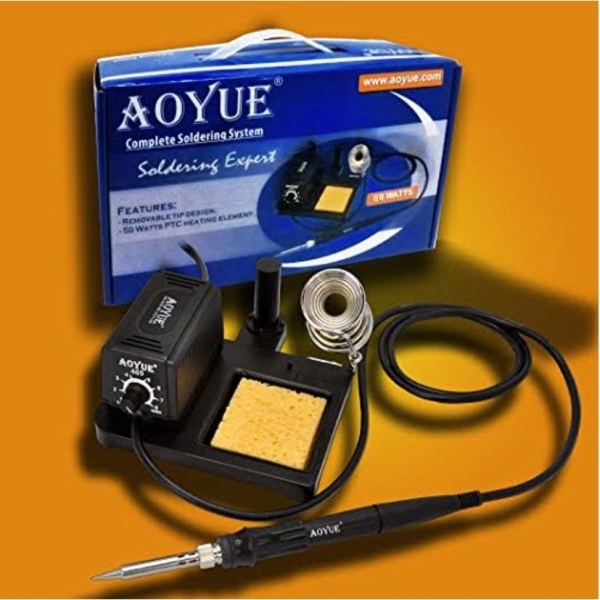 I bought a Aoyue 469 Variable Power 60 Watt Soldering Station with Removable Tip Design- ESD Safe from Amazon. 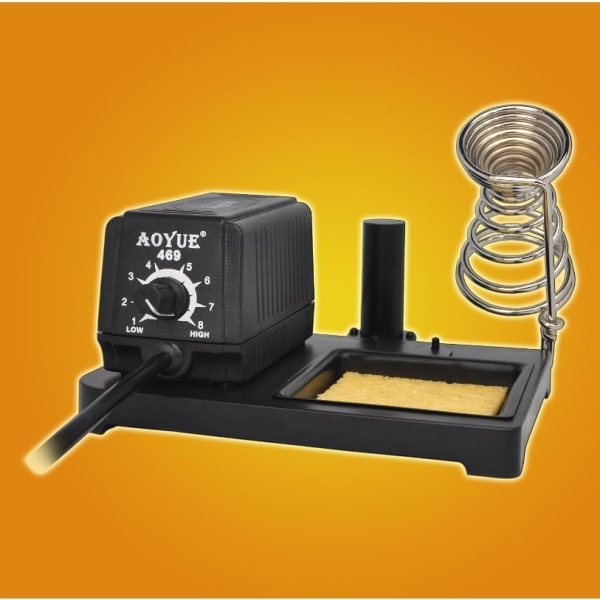 This is a great soldering station, but it’s a little bit light in weight. This makes it quite easy for it to kinda slide around when you’re using it. The brass soldering iron cleaner I got was also very lightweight. So, I took all of my soldering items and mounted them to a finished piece of MDF board with ShooGoo adhesive. 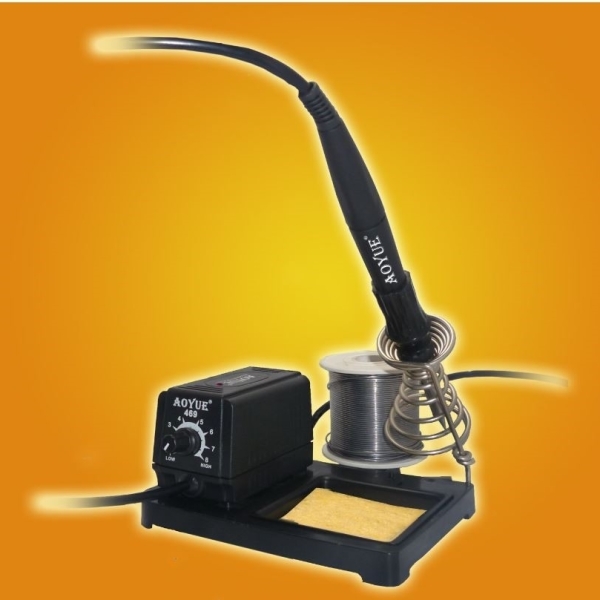 Now, whenever I want to do some RC Plane soldering, I merely pull down the assembled soldering station and everything is available, stable and ready to use. This thing heats up quick and hot. I had absolutely no problem quickly and easily soldering an XT60 battery connector to my new ESC. Soldering ESC wires to the motor….a snap! 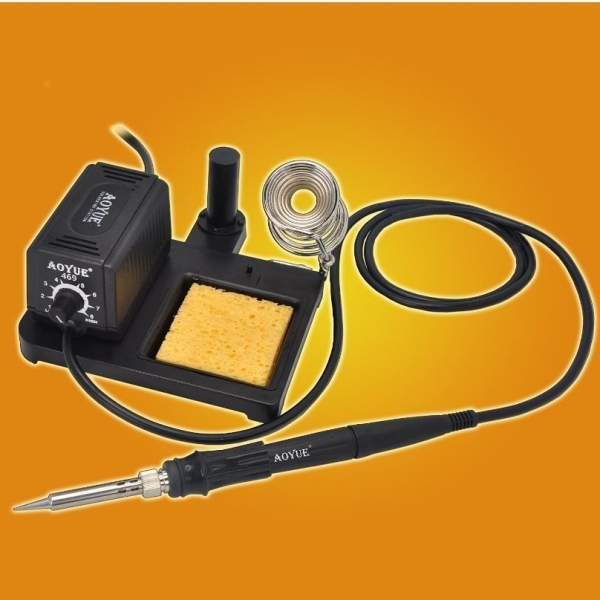 AND OMG…..the best part….my wife started a trial of Amazon Prime membership….and my order for this soldering station arrived at my house in less than 24 hours after I placed the order!!!! Our newest pilot, Jeremy Penley, takes to the air. Jeremy’s a great guy. He can build some really great looking Flite Test foamies. But his flying skills at first were a little rusty. But WOW, with a little practice, some flight simulator time, and some help from his club friends, he’s now officially “all over it” with his flying. Here’s his YouTube video of his first successful full RC flight from launch to landing. He’s flying a modified Flite Test – Simple Storch that he built himself. New Club Banner for Wally’s Squadron visit. Here’s a couple pics of our new 4’X7′ color club banner. This replaces our old black and white 2’X4′ banner. Thanks go out to Jack for his artistic insite and to Kevin for actually making the new banner. Come to Wally’s Squadron event next week to see it proudly on display! Aircraft of all tops giant scale,aerobatic warbirds, turbine jets, helicopters, micros to 60%. You name it. Best night flying anywhere. Free pilot drawings. Free pilot and family dinner Saturday. Venders welcome, no setup fees. No charge for admission. On site primitive camping. Lots of nearby motels.